La vita è bella on the Gargano peninsula. And to make it even sweeter, try staying at a local hacienda. We picked one by chance, I panicked that there will be no nice accommodation left and impulsively booked a room without really knowing that it was going to be a relaxing hacienda in a lovely setting. The B&B Shanti is located about 5 km from the town of Vieste towards the inland, with a view of olive groves and pine trees, as well as the sea in the distance. Gargano is one of Italy's 24 (!!!) National Parks and is considered to have one of the most beautiful coasts in Italy. The peninsula is situated in the region of Puglia, and covered in lush Mediterranean pine tree forest and olive groves. July in southern Italy is really hot, so we spent mornings and evenings bathing, eating and walking the crowded streets of Vieste, but during the day we would just stay in on our hacienda, lying on one of the terraces, enjoying the view and the scent of the Mediterranean (and drinking lots of water!). There were a few cats keeping us company and the one called Silvio was the funniest as he was reacting to his cool name and he would peak his head through the curtains of our room from time to time. The breakfast at B&B Shanti puts a smile on your face (and lots of tasty Italian food in your belly)- nonna's cake, homemade jams, mozarella with tomato, bruschette, prosciutto, local cheeses, ricotta with chocolate, the crunchy taralli (typical Pugliese salty snack), watermelon skewers, a bowl of fruit, all home made and local grown, of course. As the hacienda is located on steep terrain, there are multiple terraces planted with olive trees, lavender, rosemary, palms, fig trees, agavas, there is a buzzing of the bees and flies in the air, a quick movement of the lizzards on the hot stone, and a sparkling light in the olive branches. 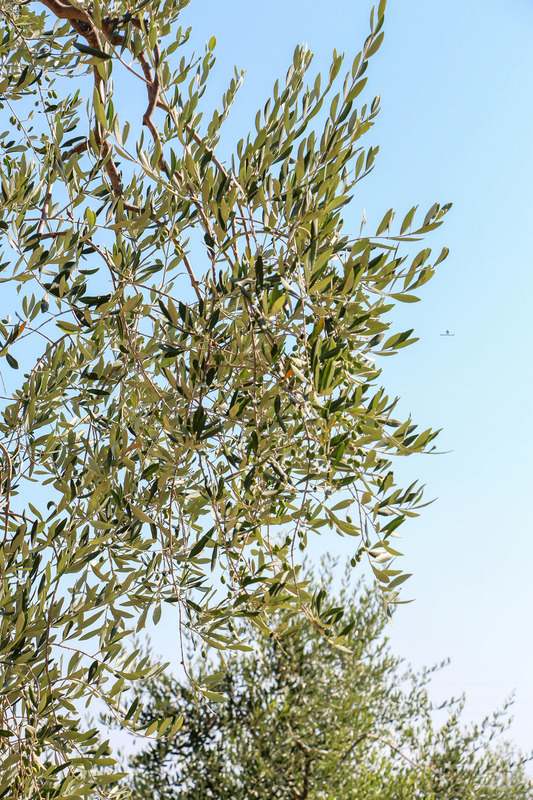 Have you ever noticed how beautiful the olive trees look in the sun and how their leaves quiver and emanate the silver and green light? I tried to catch it on my photos! As for the beaches, I read about how Gargano peninsula was once (in the remote past) connected to what now is Dalmatia, and how it resembles the Croatian coast, and so Croatian that I am, I decided that it would be best to spend our beach time in Puglia right here. :) As we started driving the Gargano peninsula, it really did remind us of Croatian coast, especially Croatian islands, with its thick pine forest and rocky coast with beautiful bays, but the color of the sea was different, and as we proceeded to the town of Vieste, the kilometers long sandy beaches appeared (uncommon on Croatian coast), accompannied by the "forest" of parasols, beach bars and restaurants, hotels, and all that we thankfully didn't have in Croatia few years ago, but it started to appear lately. Nevertheless, there are some pretty amazing sandy and pebble beaches that aren't spoiled by mass tourism, and the funny thing is that you just have to walk to them for 10 minutes and there is immediately 90% less people! The sand is fine and clean, without unpleasant surprises in form of seagrass or sharp rocks, and the sea is so warm, I have never bathed in such a warm sea! Oh how we enjoyed it, we would stay in the water for hours, and I think I haven't enjoyed the sea that much since I was a kid, and my lips would turn blue and my fingertips would shrink from the endless playing in the water. It was extremely hot those days, but in the afternoon the sea seemed warmer than the air! 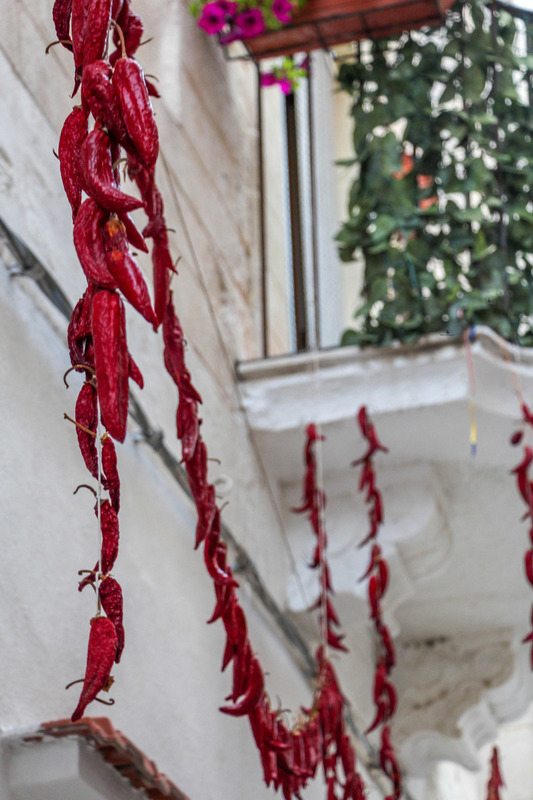 The town of Vieste is a romantic site, perched atop of a steep rock above the sea, a labyrnth of narrow streets filled with all sorts of knick-knackery, and a hoard of tourists spreading in all the directions. But the town is still charming, packed with lovely retaurants, and there is a bar called Carpenter that has an amazing view, good music, coctails and nibbles. We ate good in Vieste, seafood of course in a delightful ambience of restaurant Al Cantinone. We ate even better on a ranch situated not far away from our hacienda, called Ambrenella. Based on their good reviews, we decided to check it out, and as we followed the sign from the main road it didn't look promising. It was a dark narrow road, passing trough an olive grove, and the drive seemed quite long at that moment. Then we arrived to a buzzing, rustic restaurant, filled with both locals and tourists, and the delicious smell of the grill convinced us that it was going to be a great evening. We were greeted warmly and seated on a charming terrace surrounded by the greenery and decorated in a rustic way. We decided to eat local and typical of the area, so we ordered some olives, bruschettas, grilled caciocavallo cheese and orechiette- homemade pasta in form of a little ear (hence the name), which is a regional dish of Puglia. One with cime di rapa, and the other with tomato sauce. Cime di rapa are also typical for this region, and those are esentially the turnip leaves. The dish tasted earthy and heart warming, a real cucina casalinga (home cooking), which reminded me of the local Croatian dish which my grandmother used to make, the pasta with cabbage (literally translated from Croatian "Cabbage patches"). You can imagine that we really enjoyed this dinner, and if you're ever in Vieste or Gargano peninsula, do visit this place, it will pay off! Three days we spent here just flew by, and it was a proper vacation, three days of sun, sea, good food and resting in the shades. Our next destination was Alberobello, and we were a bit sad that we had to leave the seaside. But Alberobello was wonderful, as expected, and you can read all about it in my next post. In the meantime, I would love to hear from you, with your advices if you've been to Gargano, questions if you're planning to go, and impressions of this post in general.